Today is the feast of St. Brigid of Ireland, Abbess of Kildare. 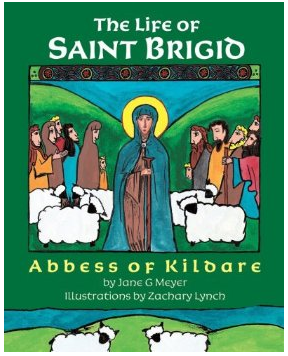 This afternoon we will be reading a few books about St. Brigid. A couple of our favorites are Brigid's Cloak (with the study guide in Catholic Mosaic ) and Saint Brigid and the Cows. This past year I also purchased The Life of Saint Brigid: Abbess of Kildare to add to our collection. It is a beautiful book, and I am glad to have it in our home collection. For those of you that don't have a picture book of St. Brigid (or even if you do), I wanted to let you all know that, like the book Lucia, Saint of Light, The Life of St. Brigid is also available to listen to at Ancient Faith Radio! I plan to play it for my children later today. 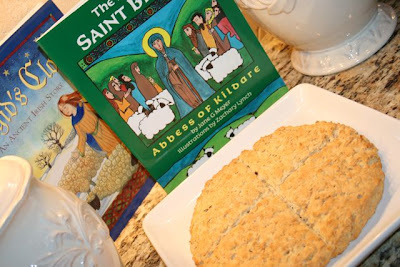 We will also be enjoying some more of St. Brigid's Oaten Bread and Irish Potato Pancakes. Don't forget to print out the lovely coloring page at Waltzing Matilda and/or copy the one from Fenestrae Fidei, and here are directions for How to make a St. Brigid's Cross. O Glorious St. Brigid, Patroness of Ireland and Mother of the Churches, protect the Irish Church and preserve the true Faith in every Irish heart, at home and abroad. Obtain for us the grace to walk faithfully in the path of Christian perfection during life, and so to secure a holy and happy death, with life everlasting, in thy blessed company, through Jesus Christ, our Lord. Amen. Wonderful, Jessica! I'll have to check out that audio link for the book. Thank so much! I'm planning on making an Irish Stew and soda bread for tonight. Today is the first day in almost a week that I feel up to cooking. I can't believe how much this illness has set me back. Thank you for all the information and resources about St. Brigid of Ireland! How does that bread taste? The bread was great, though it wasn't nearly enough for our family. I should have doubled the recipe. My kids remembered it and have asked if we could make it again, along with some more potato pancakes, tomorrow, but I just agreed with our pediatrician to try going off all dairy for at least a week and I don't think I could make it without eating any! lol... We'll have to see!